The route of the eastern bypass is across the flow of the underground water. It was ever so close to the borehole from which our drinking water is drawn. Water flows in the porous chalk sub-strata, downhill from the escarpment. But the water is not far under the ground. Oil would easily soak through. What if a fuel tanker was to have accidentally come off the embankment, crashing onto the ground below and splitting open, spilling its oil or petrol? A priceless water source risked being lost forever by a ludicrous road scheme. To ensure against all accidents, the road would have had to be within a costly high-sided concrete channel throughout its route through the Wellhead Valley. The bypass in W(C)C's bid was to be in an open cutting at the top of the valley (eg: in the ground...!) and on a low-sided embankment by the water source. The fundamental problem was a bypass on the escarpment side of the town. Here are the ground-water zones once threatened by the eastern bypass. The Environment Agency had serious concerns about the WCC bypass design, describing the County Council's environmental statement as deficient. 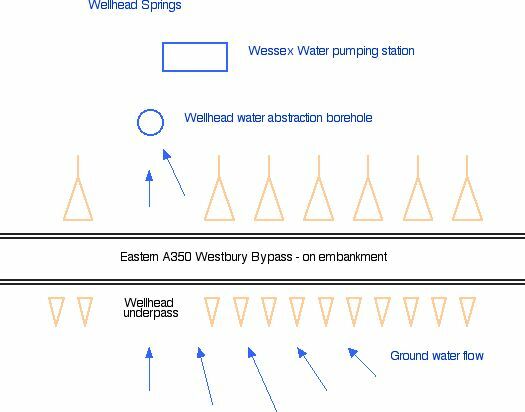 The EA was concerned about the close proximity of the eastern bypass route to the Wellhead public water source and potential for its harm during construction. The EA said that W(C)C's consultants had a worrying lack of understanding of some of the basic facts. The EA referred to the fact that the Wellhead source feeds into the overall public water supply network based at Upton Scudamore. Here is some further comment on the relative exposure to toxic spill-over.